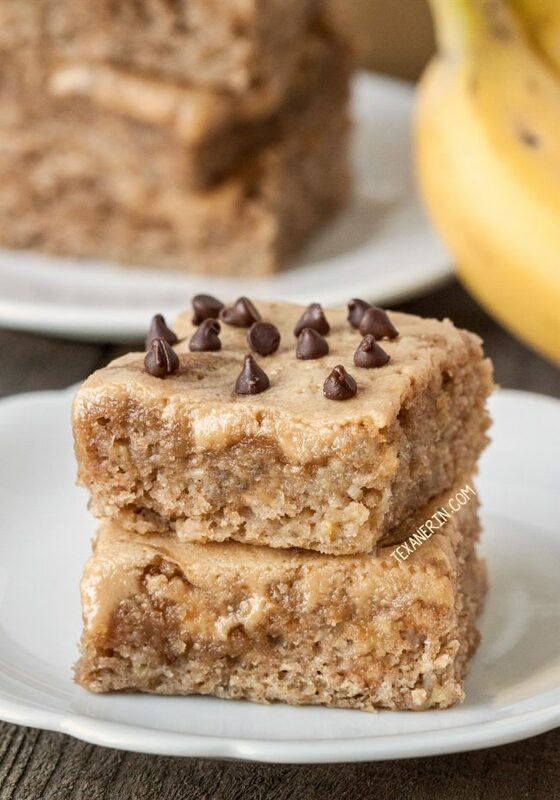 These peanut butter banana bars are like a cross between a blondie and a cake bar! They’re also made a little healthier and are 100% whole grain and dairy-free. First of all – these taste WAY better than they look. I sprinkled some chocolate chips on top in an attempt to make them look more appealing but I can’t do anything about the drabness. They just look blah. But once you taste them, you won’t care! When I try a new recipe, I normally only make a fourth and sometimes a half. This means I’m something of a fractions ninja. But I’m also pretty absent-minded and do stuff like halving one ingredient when I only did a fourth of the rest. And for the record – I always test recipes more than once before posting them so you don’t need to worry about mistakes in my recipes! When I made these peanut butter banana bars the second time, I realized that I had accidentally used twice as much flour as I should have and was really confused because I loved how they came out. I thought that perhaps it was a fluke or that my mind was playing tricks on me. So I made them again with the same amount of flour and they came out exactly the same. It was a pretty awesome morning. I adapted these form Dinners, Dishes and Desserts’ banana snickerdoodle bars. I’m sure my version with double the flour (and an extra banana) isn’t as dense and blondie-like as the original but I still couldn’t stop eating them! Erin’s version uses cinnamon, cinnamon chips and has a yummy sounding topping, which I can’t wait to try, but first I wanted to peanut butter them up. So I mixed together a bunch of peanut butter with a little honey and coconut oil and poured that over the batter. The banana bar base isn’t all that sweet but when paired with the peanut butter topping, it’s perfect. I think it also contributes to the somewhat gooey and dense texture of the bars so I really do not recommend making the bars without the peanut butter topping! I’m pretty sure they’d be too dry and not sweet enough. Want peanut butter + chocolate for breakfast? Try these easy vegan peanut butter banana breakfast cookies from Beaming Baker! They’re also whole grain as well as naturally gluten-free. 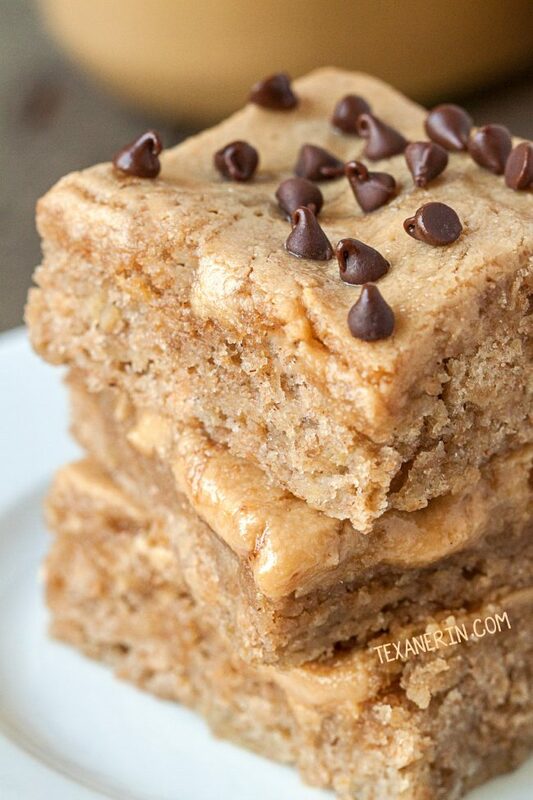 These peanut butter blondies also look like a great sweet treat! Preheat the oven to 350 °F (175 °C). Line an 8"x8" (20cmx20cm) pan with a piece of parchment paper. In a small mixing bowl, stir together all the topping ingredients until well combined. Set aside. In a medium mixing bowl, stir together the flour, baking powder, baking soda and salt. Set aside. In a large mixing bowl, mash the bananas very well with the bottom of a drinking glass (or mash however you wish). Add the sugar, coconut oil, and vanilla and stir until well combined. Add the egg and stir just until combined. Add the dry mix to the wet and stir just until combined. Pour into the prepared pan. Add the topping – it will cover the entire surface. Bake for 16 minutes or until a toothpick inserted in the center comes out without any batter on it, keeping in mind that the peanut butter layer may still be sticky or gooey. Cover and store in the refrigerator for up to 3 days. I used refined coconut oil, which doesn't have any coconut taste. If you use unrefined coconut oil, these may have some coconut taste to them. 50 comments on “Peanut Butter Banana Bars (whole grain, dairy-free)” — Add one! Thanks! It depends on the exact recipe. Sometimes chia or flax eggs work, but not on all recipes. In this recipe for one egg as mentioned, what can I substitute it with? Is it normal for the topping to be super runny? It was really hard to tell if these were done enough. Guess I’ll find out when I dig into them. I didn’t have an 8×8 so hopefully a 8×10 non stick works. Thanks. Before baking, the topping will be super liquidy! After baking and chilling, it should be much firmer and you should be able to cut the bars without any issues. I hope you like them! 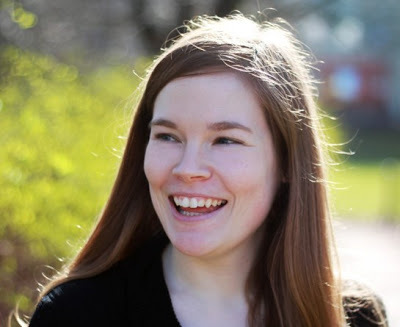 Hi Erin ! They are just in the oven and we are waiting for them to be ready. As I am a fearless baker and did not have all the ingredients I used an egg replacer and coconut sugar instead of raw. Let’s see how the bars come out. :) Greetings! Haha. I love that you’re a fearless baker! Good luck with the subs and I hope you’re enjoying the bars. :) Thanks for your comment! Yes! They were delicious. Have a good weekend and thank you for all the great recipes! Awesome! Thanks for letting me know and you’re welcome. :) I’m happy you’re enjoying them! I need to make these gluten free. Do you think using almond flour would work? What about using maple syrup instead of the white sugar? Thanks! Unfortunately, nuts flours aren’t interchangeable with non-nut flours. You could try a 1-to-1 gluten-free flour sub like this but I haven’t tried it here so I’m not positive it’d work. Sorry about that! And adding 1/2 cup of liquid sweetener in place of a granulated one would require reworking the recipe a bit. You could try coconut sugar instead of white sugar (though I think the flavor would compete a bit with the banana taste). Holy cats! I just got this to cool off enough to have one… I don’t want to share! This is straight up amazing. Thank you so much! Haha. I’m so happy you liked it! I don’t like to share this one, either. ;) Thanks for your feedback! great recipe.I think it looks really good and tastes even better.I made it two days ago and today my brother asked if I can make it again! I didn’t have natural peanut butter(and was lazy to make it myself) so the topping was not easily pourable.next time I’ll use natural. That’s awesome that you and your brother enjoyed them so much! And good to know that regular peanut butter works here, too (though I bet you’ll like your next version better with the natural stuff! ;)) Thanks a ton for your feedback! BEST banana cake ever, the texture is divine!! Spongy/sticky/cakey all in one. Total winner. I’ll be making a chocolate/cinnamon version today. Thanks for a killer recipe, used spelt and will try with Enkorn next . Oooh! A chocolate cinnamon version sounds great. Did you add cocoa powder or chocolate chips? Good luck with einkorn! I’ve had a terrible time subbing that for whole wheat and spelt so I hope it works out better for you. :) Thanks for your feedback! Those look delicious! I love when happy accidents improve recipes. OMG – these peanut-buttery-chocolatey-banana-gooey-squares of wonderfulness were just devoured by my whole family. I love your recipes in general, and this one is truly incredible! Thanks! The peanut butter topping over these banana bars just sounds freaking awesome. Oh and those chocolate chips are perfect on top! I love peanut butter, banana and chocolate together! I don’t think these look “blah” at all! In fact, I started to mentally scour my pantry for the ingredients (I think I have them all!) because I know my family would love these bars. These banana bars look so good! Love that they are whole grain! Oh, these sound just delicious! I always enjoy a combination of peanut butter and banana. Yummy! I would love such snack! I can’t even tell you how much I like these bars! The flavors go so well together I know they would be addicting to eat! 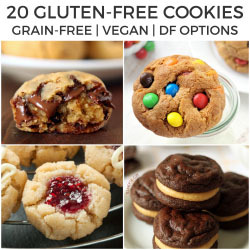 Has anyone tried these using all purpose gluten free or oat flour?? Or even almond flour? you don’t see many recipes featuring natural peanut butter…that is all I use so I love this. Peanut butter and bananas are such a comforting combination for me. I grew up eating pb and banana sandwiches, but I’m thinking a dessert bar would be miles better! I love peanut butter and banana together! Always have! And these couldn’t possible taste better than they look because they look simply irresistible. I can’t believe this! I have a post coming out over the weekend that is almost the same exact concept……save for the fact that mine are neither whole grain nor dairy-free……so I guess you win. I’m going to call this a “great minds think alike” situation, and I am honored to be on the same wavelength as you. And yes, I agree: these taste way better than they look, although I think yours look great. I think these look great.I am not big on peanut butter but they sure look good. So you used 2 cups of flour?? If you grind your own and didn’t weigh it I bet that is why they were still good and moist. Freshly ground just weighs so much less.